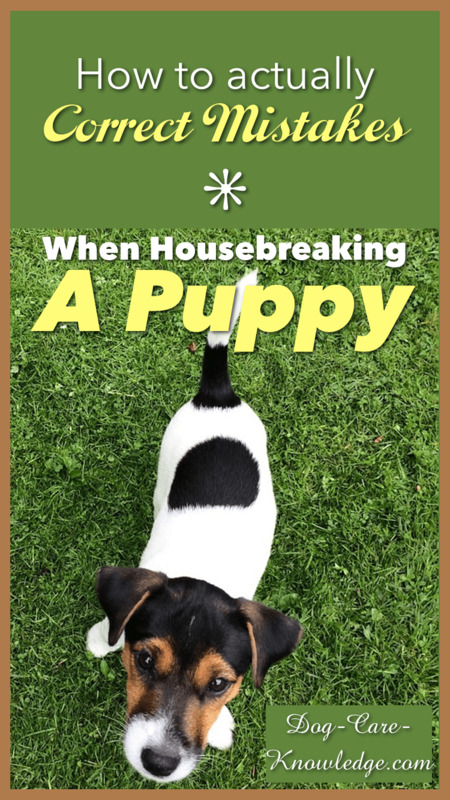 Housebreaking a puppy can be easy but what happens if it all goes wrong? And how can you actually correct mistakes already made? 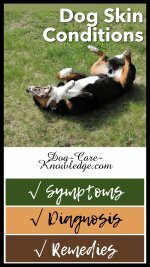 It can be hard when potty training a puppy for the first time, or if you haven't done this for a number of years, but following the right method is key. You can find details of the most successful ways to potty train your puppy here on house training a puppy. But what happens if you've already tried multiple methods and failed? 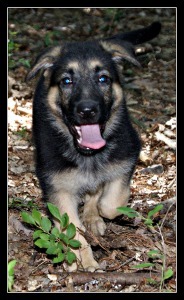 How do you get back on track with housebreaking your puppy? In other words, what should you do when it all goes wrong? 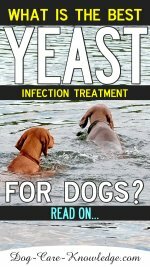 It can be extremely frustrating trying to get your pup clean when it seems like everyone else has managed it but you. But, trust me, you're not the only one to come across problems and you sure won't be the last. Unfortunately 25% of dogs surrendered to shelters, are there because of toileting issues. 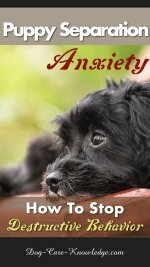 Don't let your pup become a statistic instead read through these solutions to the common most problems with housebreaking a puppy and I'm sure you'll find some answers for your dog. 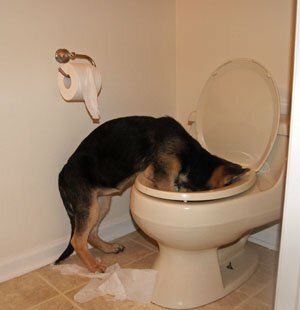 Is your puppy peeing and pooping in all the wrong places? If this is the case then confinement is the best option. I don't mean confine her to a crate, but don't let your pup have the full run of your house. If you can't watch her, or need to go out, then put her in a crate or small room. 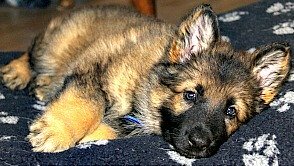 Puppies need to develop their "den" instinct as they don't like to mess in their den area. By confining them to small areas at a time, you will help them develop this instinct. Use small rooms, crates, and barriers to keep her in the same room as you are in. This way you can keep an eye on her and get her outside at regular intervals to potty. As she becomes an adult dog, she will see the whole house as her den and should not want to soil the den area. I usually keep my pup with me in the kitchen and if I need to go to another room for any length of time, I take her out to potty first and then have her confined to whatever room I am in. If I can't do that, then I put her in the crate while I am in another room or if I have to go out. Do you spend ages outside waiting for your puppy to go potty, only to find she goes immediately she returns inside? Yes, I've been there! In fact, Ava, would spend all the time outside playing with my other dog that she frequently forgot to go potty until she came in. What I started doing was to take her out for a "play" for about 10 minutes, then bring her inside and immediately take her back out again (alone) to potty. If this still doesn't work, or If at any time your pup doesn't pee or poop after 20 minutes outside, take her back inside and put her in her crate for 5 minutes. If you don't have a crate, have her tethered to you and keep a very close eye on her. After 5 minutes of being in the crate, or tethered, take your puppy to her area and try again for about 10 minutes. Repeat this step (indoors for 5 minutes and bathroom for 10 mins) until she eventually goes to the bathroom. And when she does, praise and treat like crazy! Have you followed all the traditional potty training advice only to find that its just not working for your pup? Don't despair, this is sometimes the case, especially if there have been multiple "mistakes" in the house already. And, as I mentioned before, this is fairly common when pups reach the age of roughly 13 weeks. What you need to do at this point, is hit what I like to call the "reset" button. Use an enzymatic cleaner that cleans protein-based stains, I like Rocco and Roxie Professional cleaner to thoroughly clean up every trace of pee or poop on your floors. It also works on vomit. Use a black light (found in hardware stores or online) to detect urine or feces stains you cannot see with the naked eye. Keep your puppy confined to the room you are in. If you have to go out, use a crate or small room. My house is totally open plan so we used crates and barriers to section off the house. You don't need to buy tons of barriers, you can use anything that'll work to keep your puppy out while you are home (furniture, boxes, wood, etc.). As mentioned above, this will help your puppy to develop her den instinct. Next is the "reset" part. I bought a couple of cheap remnants of carpet to go over my main area rug in our family room. This was the room that she had the most accidents in and where she would hang out with us in the evening. Although I had thoroughly cleaned my carpet with Urine Off, by putting the new carpet on top, it provided a new environment that she had never messed on. Don't get me wrong, this wasn't an expensive new carpet, its a heavy traffic remnant that costs $30 from HomeDepot. It doesn't have to be HomeDepot either, I'm sure any carpet or hardware store will sell something similar. Or maybe you even have some remnants laying around. Then, I started all over again with the basic steps for housebreaking a puppy stated on the previous page. She never did mess on the remnant carpets but I would have cleaned it up with the Rocco and Roxie Enzymatic cleaner if she had. Although the process of housebreaking a puppy is fairly simple, there are a few things that you shouldn't do and why. If your puppy does have an accident indoors, DON'T take her over and rub her nose in it. She'll make absolutely no association with the mess, her behavior or involvement. It definitely does not teach a puppy housebreaking etiquette. In fact, all it is likely to teach her is that humans are unpredictable and to be avoided. Don't hit her with a rolled up newspaper or anything else for that matter. Hitting a dog or punishing her for unwanted behavior just doesn't work. You pup will make no association with the behavior and the punishment after the event. They are more likely to learn that humans are aggressive and will want to avoid you. Even if you catch your pup in the act of going to the bathroom indoors, don't hit, yell or grab at her. I know it may be hard, but just ignore it. Otherwise, your puppy will learn that it is bad to go to the bathroom in front of you and will try and find ways (and places) to go to the bathroom where you can't see. Under tables, behind furniture, when you leave the room, etc., etc. Unfortunately, these behaviors can seriously put housebreaking a puppy way behind schedule and you may find you have a much harder job to try and house train your puppy. But, it is most certainly not impossible if you stick with these tried and tested methods and solutions.